Drivers often like to cite errant or reckless bicyclists as the cause for collisions or accidents, but their own lack of attention or decision not to provide the right of way are normally the greatest contributing factors. The Chicago bicycle accident attorneys of Rosenfeld Injury Lawyers LLC have helped thousands of bicyclists injured in auto accidents recover the compensation they were duly entitled to after being struck or doored by a negligent driver. As a cyclist, however, it may benefit you greatly to understand the common causes of these accidents so that you can take a more active and defensive approach to staying out of harm’s way. Some of the most common causes of bicycling accidents are due to the position of the bicyclist on the road relative to the motorist who collides with him or her. There are five different types of accidents that can be attributed to the position of the bike or vehicle, which follow below. Dooring accidents— a dooring accident is one where the bicyclist runs into a car door which has been opened into his or her path. This is common on busy streets with heavier traffic that forces bicyclists to ride closer to parked cars. It is the responsibility of drivers to make sure that they check to ensure no bicycle or vehicle is coming prior to exiting their vehicles. The best way to avoid this is to move to the left. This does place you into another precarious position, however. Side swiping bicyclists— side swipes occur when the motorist doesn’t give the bicyclist enough room while passing. It is a common complaint by drivers that bicyclists get in the way of traffic when they move to the left, but the alternative is to place themselves at greater risk of being doored. Illinois law protects the bicyclist by requiring drivers to maintain a safe distance whenever overtaking any bicycle. Rear ending the bicyclist— most drivers who rear-end bicyclists are not paying attention or are following way too closely. These accidents are common at stop signs and when a cyclist is attempting to move left in order to move around parked cars. Crossing in front of the bike— “right cross” and “left cross” accidents have the same cause, and that is a vehicle crossing into the bicyclists path at an intersection or from a driveway or alley. In both cases, the bike has already entered the intersection when the turn is performed and visibility is the primary factor. Drivers are either not paying attention or do not see the bicyclist. The best way to prevent these accidents is to wear clothing that makes you visible, use a headlight and reflective gear at night and ride further to the left so that you have more time to react. Drivers turning into bicycles on their right side— if a bicyclist is to the right of a car at an intersection, he or she may be hooked by the vehicle if it is turning right. Many drivers simply do not check their blind spot before making a right hand turn. Riding farther to the left makes you more visible, as the driver will need to overtake you in order to perform his or her turn. Our Chicago bicycle injury lawyers have noticed that the majority of bicycling accidents can be prevented if drivers were more aware of their surroundings and acted more responsibly. Distraction is a key cause in auto accidents as well as in accidents involving bicyclists. 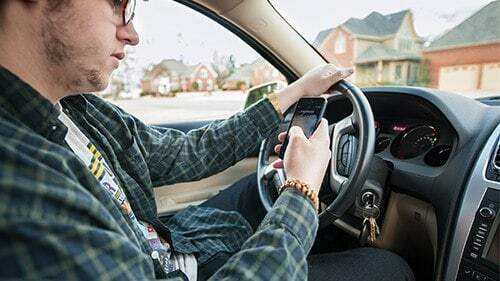 New technologies and a fast paced society have encouraged more people to multi-task when they are behind the wheel, despite documented evidence that doing so increases their likelihood of being involved in a collision. Other causes of bicycle accidents can include the following. Speeding— speed is a factor in many accidents, including those involving bicyclists. Drivers who are in a hurry have less time to react and this can be catastrophic for an unsuspecting cyclist. Weather— most bicyclists avoid riding in torrential downpours, sleet, ice and snow, but weather can still be the cause of an accident. Rush hours usually coincide with when the sun is in the best position to blind drivers with glare if they are driving into the sun. Bicyclists who are caught in a rain storm are also much less visible and should wear reflective clothing or have a headlight to make their presence known. The influence of drugs and alcohol— drunken driving is the cause of one out of every three auto related fatalities and bicyclists are at a greater risk due to the limited protection they have. There is no excuse for drivers to take the wheel while intoxicated and should be held fully accountable for their actions. Reckless bicyclists— the act of riding a bicycle does not excuse someone from acting in a responsible and safe manner. There are many accidents involving bicyclists that are clearly the result of the cyclist making sudden movements into the path of vehicles, failing to make themselves visible, running stop signs or stop lights or acting in an otherwise aggressive manner. These bicyclists place themselves at risk, but may also put other cyclists in harm’s way if riding in a group. Failure to follow traffic control devices— motorists who fail to stop at a stop sign or light are a danger to everyone around them. It is reasonable for bicyclists to expect vehicles to yield the right of way, but they should never assume that the driver will do so. As Chicago continues to become an even friendlier city for bicyclists, it is important to develop safe habits in order to stay safe on the roads. Drivers and bicyclists alike should be aware of the most common causes of accidents and apply appropriate measures to ensure their safety and those around them. Rosenfeld Injury Lawyers LLC is an award winning personal injury law firm that has represented the needs and interests of countless bicyclists who suffered devastating injuries in bicycle accidents. If you have been injured in an accident, we have the resources needed to connect you with the medical specialists needed to help you through your recovery and an expert legal team that has experience and success recovering damages on behalf of clients in similar positions. Contact us today to learn more about what it is that we can do to assure you the greatest chance of a successful recovery and how we can maximize the value of your case. Your Chicago bicycle accident attorney will collect all of the information needed to evaluate and investigate your matter and will review all of your legal options with you so that you know exactly what you can expect each step of the way. We also ensure every one of our clients that our services come absolutely risk-free and you will never be asked to pay attorneys’ fees until we have secured damages on your behalf.